“Welcome to the Chalmers Gluten Free Bakery and Restaurant. How can I help you?” was the most popular quote around our back yard playhouse this past fall. My daughters (both gluten-free) had set up their playhouse to play their pretend game, complete with menus, notebook & pen to take orders, and a whole slew of pretend plastic food and kitchenware. “Of course!” like I was crazy or something for even asking. In their pretend world, every luscious-looking baked good and “Happy Meal” is gluten-free — “where food always tastes good” as they wrote on their menu. I love it. They came up with this game all on their own, which makes me love it even more. It’s so cool to see them having fun with gluten-free, and it’s great to see them taking pride in playing games like this. It is a wonderful sound to overhear your children just having fun imagining, creating, decorating, pretending…and dreaming — totally unplugged. 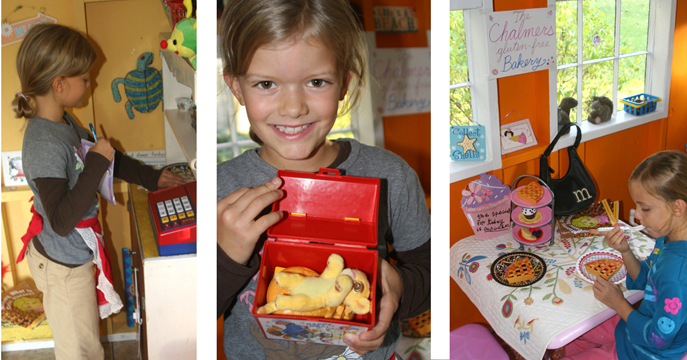 The first time I really remember them playing “gluten-free bakery” was Christmas 2010 when they received a bunch of pretend play food. 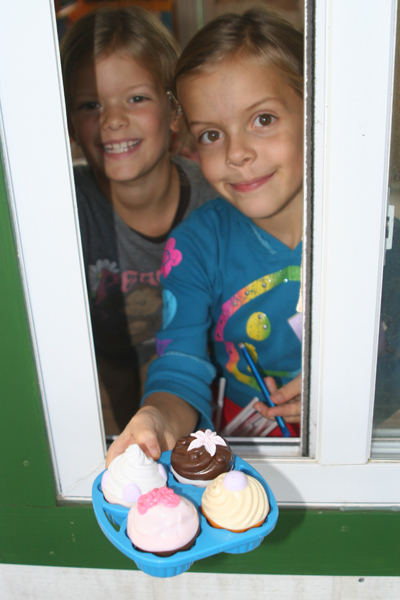 The next day they had set up their play closet as a bakery (below) with a centerpiece, tables, menus and ice cream, too. They invited their cousins over. They invited parents, grandparents and anyone else who visited our house. After a few weeks they moved on to something else, and the closet was transformed into some other kind of fort, but they sure enjoyed this game while it lasted. Last month we were on vacation in the Orlando area and went, one day, to Downtown Disney, upon recommendations from some of the awesome Moms who have come together on my Facebook page. They had told me about BabyCakes being there — an all gluten-free bakery. (In fact, I believe most everything they offered was gluten-free, plus dairy-free, egg-free and soy-free). You can imagine how excited my girls were to see this place. 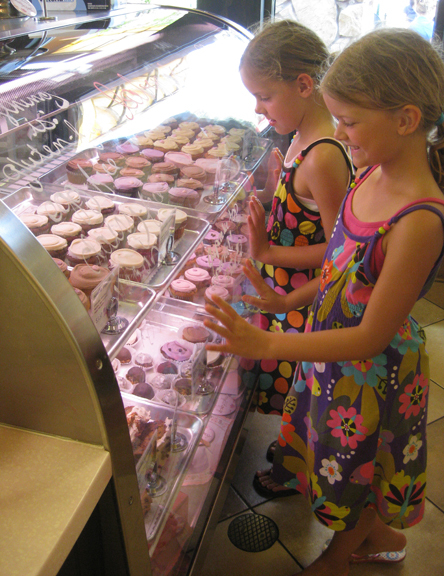 I’ll admit: I had them expecting a little too much (I had said we’d be walking into a big bakery and they’d be able pick out whatever they wanted) but they were still super excited to even see a small all-gluten-free bakery in the corner of a restaurant. We each picked out a dessert and took it “to go” to eat after our lunch at T-Rex Restaurant next door. It was hard to wait (and our to-go box was opened repeatedly for sniffing noses and sneaky licking fingers) but we thoroughly enjoyed everything. Morgan chose a lemon-frosted cupcake, Lindsey picked a mint-frosted brownie cupcake and I decided on a cookie sandwich (2 large, thin chocolate chip cookies with frosting in between). Besides the goodies shown below, there was another area with banana breads, donuts, and other sweet treats. They had never seen so many gluten-free goodies together in one place before and you could tell that they thought it was a very cool place. Since that vacation, their gluten-free bakery has been re-established in the playhouse since we’ve been having an unseasonably warm Spring. It’s much the same except for a new sign, menu and decorations. It’s wonderful how some things just never get old! Has your g-free kid had any gluten-free dreams become reality? Are you lucky enough to live near one of these all-gluten-free bakeries? As always, feel free to post a picture on my Facebook page and/or comment below. Thanks! 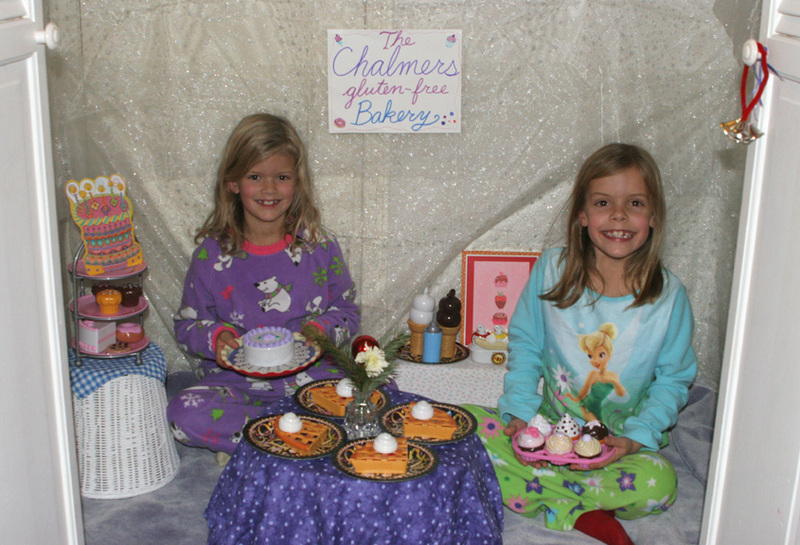 This entry was posted in awareness, fun for kids and tagged celiac awareness, celiac kid, fun, fun ideas, g-free kid, gluten free bakeries, gluten free bakery, gluten free kids, gluten sensitivity, gluten-free kid, pretend play, raising awareness by kachalmers2. Bookmark the permalink. Yay for gluten-free bakeries! 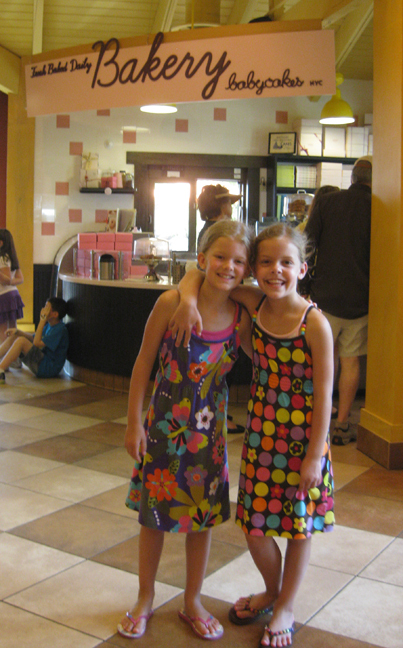 Katie, your daughters are adorable! So glad everyone enjoyed Babycakes, T-Rex, and Disney. We can’t wait to go again!